News Splash! Waterproof Printed Products has arrived at Eveready Printing! Eveready Printing, a 115 year old company, owned by father Roger Wolfson and son Scott Wolfson, recognized the need for this unique product. Our first thoughts were that the restaurant and hospitality industries would benefit from this product. Currently, customers are using either laminated or paper menus. The downside to laminated menus is that they can be bulky and the lamination can peel. Paper menus have to be replaced constantly due to rough handling by customers, which in turn require the restaurants to print large quantities. The benefits of our waterproof menu products are tear resistance, spill resistance, and a rich feel. 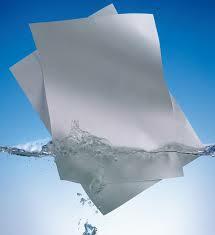 There is no need to print large quantities, since the waterproof menus can be used multiple times before replacing.